What Happens to the Buffalo Bills with Nate Peterman at Quarterback? The Buffalo Bills made the quarterback switch that many of us had been hoping for. Now that the move has been made, what does the future look like for the Buffalo Bills? Weak Points – Doesn’t have ideal size at 6’2 ½”, doesn’t consistently throw a tight ball. A high percentage of his throws are of the short to medium range type. Doesn’t have the canon arm that some NFL QB’s have. Summation – ….Fifth year senior and a two year starter at Pitt where he put up good numbers….Peterman is smart, makes good decisions and is a strong leader on the field…Has as quick a delivery as any quarterback in this Draft…..Is accurate and able to place the ball in the right spots…If is arm was a little stronger, he would be considered one of the top QB’s in this Draft…. After watching Peterman in preseason and his play last week versus New Orleans, there is nothing he has done that makes me change my mind on my original evaluation. In fact, I feel he has exceeded expectations so far this year. Why Did the Bills Make the Change? With the Bills having a new front office and coaching staff, they had to get to know what Tyrod Taylor could and couldn’t do. It takes time to do a fair evaluation. Add to that, the Bills won early in the season despite Taylor’s limitations. After the two recent losses, the Bills knew that Taylor had taken them as far as he could. While Bills fans want nothing more than to see the Bills win and earn a spot in the Playoffs, the 2017 season is more about learning who can and can’t play in Head Coach Sean McDermott’s system. The staff is trying to build a perennial contender and to do that they have to know everything they can about every player on the roster. In the first half of the season they found out that Taylor just wasn’t good enough to be a consistent winner in the NFL. Now they have seven more games to find out about Peterman. This is important because if Peterman shows promise, than drafting a quarterback in the early rounds of the next draft is taken out of the equation. Personally I feel that Nathan is a winning NFL quarterback and is talented enough to take a team to the playoffs. I have said on numerous occasions that I feel he is this past draft’s Kirk Cousins. Their skills sets are similar and if Peterman turns out to be close to the player Cousins is, than the Bills have themselves their quarterback of the future. That being said, Nate is a rookie and Sunday will be his first NFL start. He will make mistakes and the Los Angeles Chargers will do everything they can to confuse and disrupt Peterman. The important thing is that he grows and improves from week to week. His talent, intelligence and maturity lead me to believe that this will happen. What we saw with Tyrod Taylor is that his limitations kept him from making the Bills wide receivers an integral part of the Bills offense. In the limited play that Peterman had last week, we saw him target his wide receivers on, I think, eight of his ten throws. Getting the ball to his wide outs will help the Bills offense tremendously and actually help the run game. The next seven weeks will be an interesting part of Bills history. 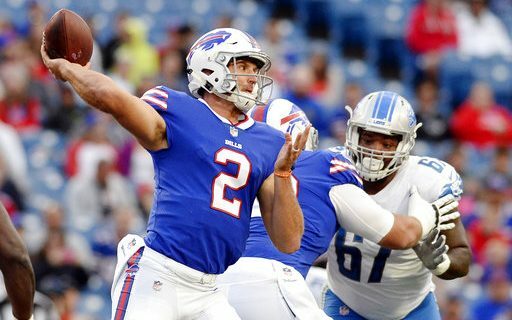 I’m betting that Nathan Peterman will make the Bills future look a lot brighter than it is right now! Editor’s Note: Greg Gabriel saw this move coming early in the week, before McDermot’s announcement. Read his story here.